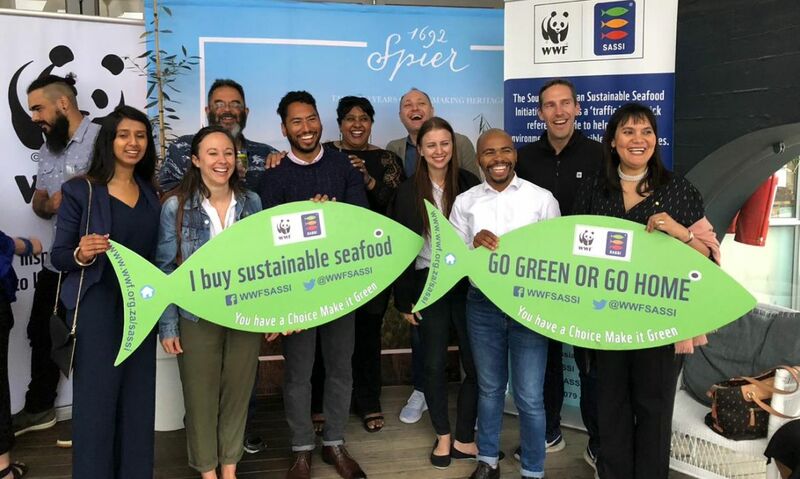 Eight new South African chefs have been awarded WWF-SASSI Trailblazer status for their commitment to the use of sustainable seafood. The WWF-SASSI Trailblazer Awards 2018, which were made on Monday 29 October at Harbour House at the V&A Waterfront, recognise and celebrate chefs who actively champion sustainable seafood practices in their restaurants. and, the 'Trailblazer factor' (those chefs and restaurants that are going the extra mile in promoting and supporting seafood sustainability). Lucas started out as a commis chef at Aubergine Restaurant. He is now the executive chef at Makaron Restaurant, Majeka House. Home-grown excellence, simplicity and honesty are the hall marks of his cooking. Locally sourced, ingredient-driven dishes bounce off the menu. Seafood is a strong feature at this restaurant. He is committed to using only sustainable fish. Lucas is still dreaming about the fresh sardines he ate on his recent trip to Lisbon. Michael is a breath of fresh air with a humble and down to earth approach when it comes to creating his ingenious and sublime dishes at Camphors Restaurant. He's worked at Heston Blumenthal's Michelin-starred The Fat Duck, following that up as head chef at La Colombe and the Greenhouse. So, he is no stranger to the starry world of cheffing. But at the root of everything he does is sustainability and respect for his ingredients. He is insistent that green is the only way. James is the definition of home-grown success, starting with his Mom who taught him flavour combinations and how to use everything in the garden. James's philosophy for provenance, seasonality and sustainability is what really makes his restaurant, Coobs, one to keep on your radar. He sources the majority of his produce – wild boar, chickens, mielies, pumpkins, cucumbers, string beans, edible flowers and more − from the family farm in the Magaliesberg, Brightside. When it comes to fish he is insistent on only using sustainably caught fish. Xavier grew up in the idyllic coastal city of Durban, South Africa – perhaps the origin for his love of seafood. At oneNINEone, he enjoys creating new dishes, which serve as an expression of his childhood memories. When creating a new dish, he will always start with a core component and builds the dish around that. "I'll create the dish, then I'll strip it down. This shows our skill and our care and also means that there is no wastage with produce." He is acutely aware that the seafood produce which he purchases, cooks and serves makes a difference with regards to sustainability. Chef and owner Ash was born in Mthatha and raised in Cape Town. Ash knew she wanted to be a professional chef by the time she was ten years old. No other career was ever an option for her. Ash earned her laurels at the Test Kitchen. She followed this up in London with stints at the Ledbury in Notting Hill and Dinner by Heston Blumenthal. Back in Cape Town she is has just opened her second restaurant called Riverine Rabbit. Sustainability is in the heart and soul of the food which Ash is dishing up. She makes her debut on Netflix this coming season on November the 20th on a show called The Final Table. Kayla-Ann is a talented, dynamic chef who has always had a passion for cooking. "I always wanted to be in the kitchen from a very young age, right from the days I spent cooking with my Gran. I have been obsessed with food ever since. It was never really a choice I made, it was just what was going to happen". She is truly passionate about sustainability both personally and in her work in the kitchen at The Chefs Table. Her love of fresh, seasonal and locally sourced produce has driven her to create dishes that honour the flavours and textures of the ingredients. Her dedication and unique style saw her receive The Rising Star Award in the 2017 Eat Out Awards. Louis believes that there is an important role to play in countering the negative effects in our world especially when it comes to sustainable issues. As he says, "Anyone can be trained to do fancy icing but what's far more significant is how we as chefs can educate the public and change attitudes. We need to make people think more about what they choose to eat and how our food products are sourced. We've already lost a huge amount of fish stocks from over-fishing, and eating this wonderful product is fast becoming a luxury. What will be left for future generations?" Glen is a born and bred Capetonian from the Southern Suburbs. He got his big break at La Colombe at the age 21 when he was made pastry chef. This is the move which has set him on a course that has brought him to where he is today. He is chef and co-owner at Foxcroft where seasonal perfection is experienced in every bite. It's no surprise Glen’s passion for the use of sustainable produce shines through. By the way, Foxcroft is Glen's middle name – not a lot of people know that. WWF staff celebrate all the hard work that goes on behind the scenes in the interests of sustainability.